From Adrian, go east on Missouri Highway 52 for 13 miles to Ballard, go south on County Highway BB for 1 mile, turn left (east) on County Road #9004 and go ½ mile. 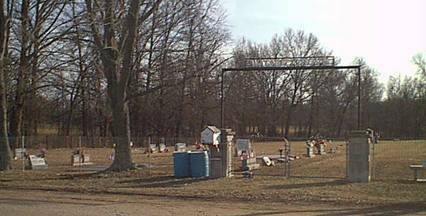 The cemetery is on the south side of the road. Continue east a short piece and the Walnut Grove Church is on the north side of the road. Walnut Grove Cemetery is nearby the Walnut Grove Presbyterian Community Church. The cemetery land was given by Henry Winegardner for early burials in 1886. In the 1870’s the Cumberland Presbyterians and the Methodists held services at the Enterprise School House. They held Revivals there together. In 1881 Rev. Previne McCluney of the Cumberland Presbyterian Church and Rev. Bathurst of the Methodist Church held a series of meetings in the Enterprise School House. As a result of these meetings 28 persons were converted and received into Presbyterian, Methodist, and Baptist Churches. In 1882 the Presbyterians bought land from Mr. Andrews, where the church now stands, and built the west part of the Church. Lumber was hauled in wagons from Holden, Missouri by members to construct the Church. In 1898 the east part was built. In 1953 a Lords Acre Project was organized in Walnut Grove. A bountiful dinner was served by the ladies of the Church. In April 1956 a house was purchased from Manuel Hooper so there would be a Manse for the minister. In 1963 under the capable leadership of Rev. Jack Newell a remodeling project was begun. The old stage was enclosed and made into three classrooms, the porch was enclosed to make another room, later the ceilings were lowered. The side walls were paneled and new colored windows added to the main building. In 1976 an addition was built on the south side of the church. Here is where we serve our family dinners, and our young people have their Sunday school class.